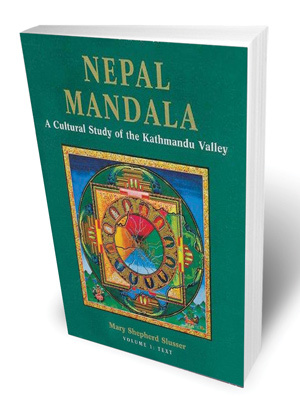 Within two months, we have experienced the departure of art historians Eduard Sekler, Sukrasagar Shrestha, Dina Bangdel — and now Mary Slusser, author of the monumental two-volume Nepal Mandala, a gentle authority of Nepal’s art and iconography. Mary Shepherd Slusser was born in 1918, and arrived in Kathmandu as the spouse of an American diplomat in the 1960s with a doctorate in South American archaeology. Following in the footsteps of the pioneering Sylvain Levi and Brian Houghton Hodgson of the previous century, Slusser quickly understood the treasures hidden within the Valley’s toles and bahas. In Washington DC, Slusser lived in close proximity to the Sakler Gallery on the National Mall, where she worked. Age 97 at the time, Slusser felt the tragedy of the 2015 Earthquake much more grievously than many of us walking these ruins. Observing the devastation from afar, her worries came to focus on Kasthamandap, the spiritual fulcrum of Kathmandu Valley, as Mount Meru is to the Universe. In the words of distinguished conservationist Neils Gutschow, the sattal is ‘the pivot of the (Valley’s) entire urban landscape’. Slusser was an authority on the Valley’s cultural microcosm taken as a whole, but repeatedly she returned in her research to Kasthamandap, and in 1974 produced a book on the sattal with University of Madison-Wisconsin based scholar Gautam Vajra Vajracharya. ‘Slusser played an important role in ensuring that the works of Nepali academics were disseminated and recognised worldwide,’ writes Risal. And it was to these friends that she turned as the ground shook in her Nepal Mandal. We have communication between Slusser and her Nepali colleagues which show how all of her heartfelt fears for the Valley as a whole were poured into her worries for the fate of Maru Sattal (Kasthamandap) – not merely the wood and brick, but the intangible culture that the structure represented and hosted. Kasthamandap was built about 1,300 years ago to serve, according to Slusser, as a ‘public hostel’ or rest house, situated at a crossroad of the ancient north-south trading route before the Kathmandu city-state grew around it. Used by ‘pilgrims, merchants, mendicants and other wayfarers’ from the Valley and the surrounding hills, the sattal’s location would have been ideal because of the Maru Hiti water source nearby. While it was the ‘the largest brick and wooden building ever built in Nepal before the eighteenth century’, writing in the Asian Art web portal, Slusser conceded that ‘despite the stellar position Kasthamandap held in the cultural and architectural history of Nepal, it was not a very attractive building. Austere and ponderous, it was but little ornamented’. What mortified Slusser, clear in her writings to Risal and the scholars Kashinath Tamot and the late Sukrasagar Shrestha, was the fear that the frieze was lost in the mayhem after the earthquake, the disorganisation of recovery efforts, and the use of bulldozers to pick up what was considered scrap wood but which in fact contained the artistic outpouring of the ancestors. After the earthquake, Slusser feared that the frieze was gone. Imagine her delight, then, when she learnt on 7 September 2016 from Shrestha and Tamot that most of it had survived intact and that the various pieces had been located in storage inside the Hanuman Dhoka complex. Hopefully, Slusser was not told of the row that has now erupted between the newly elected representatives of Kathmandu Municipality and the citizen activists who had organised to restore the sattal. It is an unseemly fight that has delayed the restoration, and it weakens the cultural aura that Kasthamandap sheds as the centre of Nepal Mandal and Nepal, the nation-state. The controversy needs to be resolved and restoration work begun, for all the reasons that Mary Shepherd Slusser valued in the sattal Kasthamandap. "My one foot is outside the jail gates." 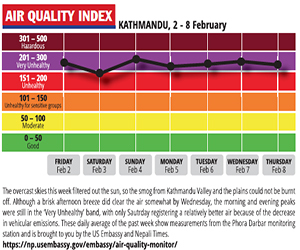 There is more than meets the eye in Kathmandu these days. The piwancha produces a firm, warm, thick sound and it heralds the revival of Nepals ethnic music traditions. 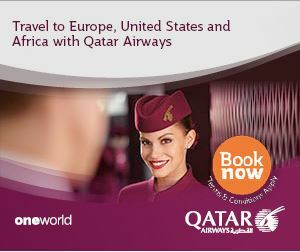 One great leap forward, two leaps back? The Maoists have used the political confusion in Kathmandu to re-strategise their "forward leap". But there may be factors they havent taken into account.